Begin your day downstairs in the Lounge & Patio brunching with your favorite people and then enjoy getting ready in the Bridal Suite & Groom's Room. Spend a few moments with each other in the First Look Nook before the family gathers for pictures and the day you've always dreamed of carries you away! 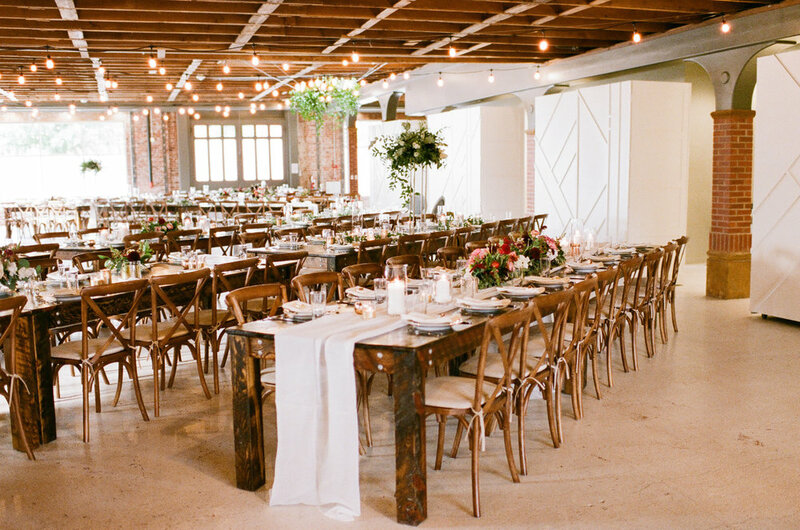 All the charm of brick and wood ceiling trusses and all the sparkle of crystal chandeliers make The St Vrain's ceremony space the perfect combination of Industrial LUXE details. Whether your wedding is 100 or 250, your ceremony promises to be both intimate and beautiful! DISH A FEW MORE DEETS, DARLING! Located right in the middle of Colorado's beautiful Boulder County, we are delighted to bring you the freshest local ingredients of the season! (Napkin, anyone?) Dine & dance in what was one of the earliest automobile showrooms in Colorado surrounded by brick walls and Cafe Market Lights!